Planning a trip to Raleigh, N.C., can be more than an indulgent culinary journey—you can actually learn to whip up a new dish yourself! Check out this list of establishments around that regularly offer classes to pick up some new cooking tricks and skills. One of the establishments offering cooking classes in North Hills, classes at Sur La Table start at $69 and last about two hours. Worried about sautéing solo? Don’t be! Each class breaks up into groups of four, so you&apos;ll be meeting new people as you hone your skills. Classes here are offered in two formats: hands-on (full participation) and demonstration (observation only), and upcoming classes include Date Night: Great Food on the Grill, Fried Chicken 101 and Perfect Pie from Scratch. Wear comfortable, closed-toe shoes as you&apos;ll be standing and cooking for most of the class. Located in Crabtree Valley Mall, Williams-Sonoma is not only prepared to stock your kitchen with chef-grade tools, but they&apos;ll also teach you what to do with them. With offerings ranging from technique and cooking classes to programs just for kids, check out their event calendar when you&apos;re planning a trip. And while you&apos;re there, don&apos;t forget that any purchases made the day of your class will include a 10% discount—pretty sweet! 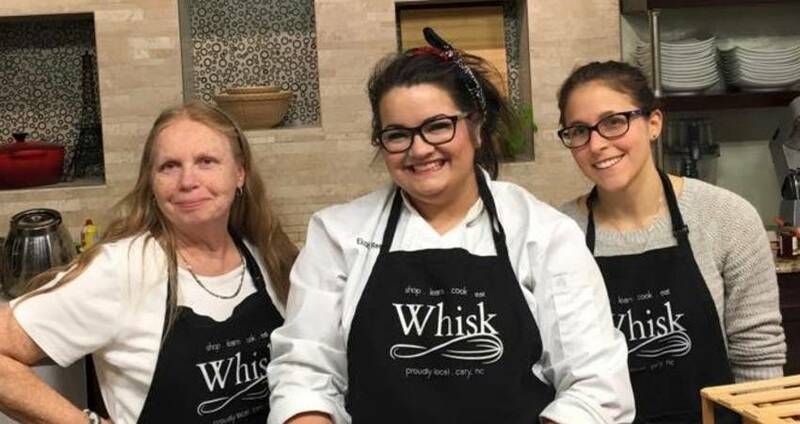 Taught by some of the area&apos;s best chefs, classes at Whisk go beyond teaching a recipe from a cookbook and go in-depth on the tools, skills and techniques used to perfect your dish and even create new dishes of your own. Much like Sur La Table, Whisk offers both hands-on and demonstrational classes, and both allow for open conversation. Classes start at $59 and cover the basics, gourmet, baking, wine and beer pairing, global cuisine and more. You can also host private cooking classes that feature an unforgettable meal with a custom menu, theme (our favorite is the Iron Chef-style competition) and budget, typically ranging from $69-89 per person. Sally is a writer and a graduate of North Carolina's Elon University. In her spare time, she enjoys volunteering at a local animal shelter, frequenting the abundant farmers' markets and discovering the hidden gems of Raleigh. She loves everything local, from beer to bluegrass, and has her sights set on sampling every ice cream shop in the destination.